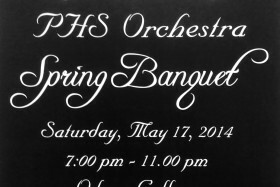 The Permian Orchestra Spring Banquet will be held THIS Saturday, May 17th at 7pm in the Saulsbury Conference Center on the campus of Odessa College. All tickets are $20 and all Seniors are FREE! Come for dinner, awards & dancing! Dress is semi-formal. Please call (432) 634-9482 for tickets!